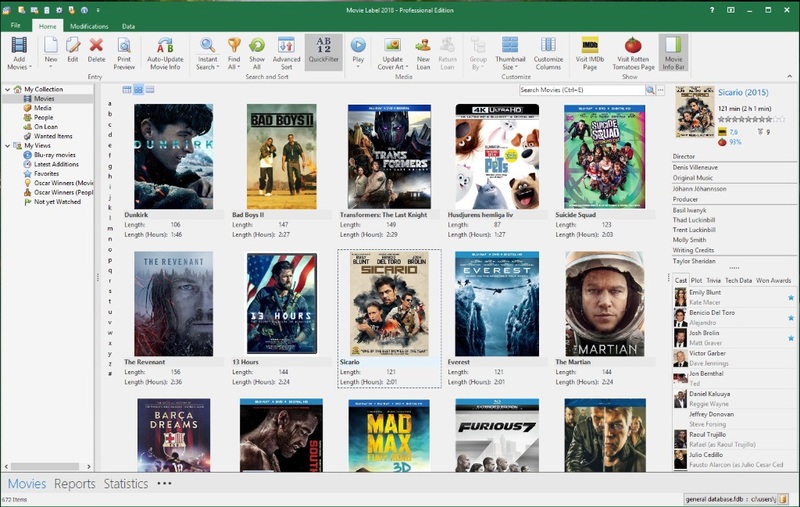 Free Download Movie Label 2013 13.0.3 - Organize your movie collection on your PC. Movie Label 2018 helps you organize your movie collection. Add movies by typing title, barcode or scanning your hard drive for Divx etc. All information (including cover art) is automatically downloaded, no typing is required. Any type of video media (DVD, Blu-ray, Divx, etc) can be added. Movie Label even let you keep track of loans and future purchases. Movie Label comes with several different languages and fully supports Unicode. Movie Label is built on a solid database engine that ensures stability and speed no matter the size of the database. A variety of reports can be printed and detailed statistics can be accessed. Your database can even be exported to Netwalk Movies (to bring your collection with you in your iPhone/iPod/iPad). Movie Label is available in English, German, Dutch, French, Spanish, Danish, Portuguese, Italian, Croatian, Czech, Polish, Norwegian, Turkish, Russian, Latvian, Serbian, Simplified Chinese, Traditional Chinese, Arabic and Swedish. Movie Label 2013 13.0.3 - The easy way to organize your DVD and movie collection on your PC.